International Women’s Day just passed on March 8th. A “holiday” that feels only half resonant with some of us on the Kindle Project team. We’re an organization founded by women, and staffed primarily by women. Over the years we have supported and partnered with many organizations that work on women’s issues, and because of this we also know how much work still needs to be done to elevate women’s roles in almost every level of society. The issue of access is particularly pressing. In the case of this week’s grantee feature we hear from the Women on Waves (WOW) Director, Rebecca Gomperts, about the issues around internet and information access for women. WOW’s work is all about bringing access to women – access to safe and legal abortions, access to accurate information about medical abortion, and access to support and sexual health information. In addition, they spread many of these messages through direct action campaigns. Last autumn, WOW held a campaign in Morocco in which they brought their ship (which offers safe medical abortion services) to the port in Smir. 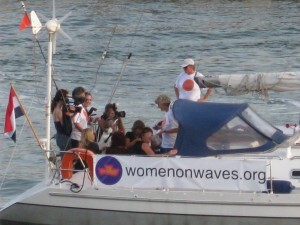 Though they faced severe resistance and scrutiny (and were ultimately not able to offer direct services on the ship because of this controversy) they took it upon themselves to use the opportunity to bring more awareness and education to these essential women’s health issues by creating a safe abortion hotline. Their nimbleness, and astute knowledge of international law, human rights and media tactics are in large part of what allows them to be as successful and influential as they are. Those that work at WOW are some of the most impactful and empowering risk-takers we know. They are true champions of social and reproductive justice. When we know that thousands of women every day all over the world are having abortions and often in very unsafe conditions, it astounds us that more groups like WOW don’t exist, that there aren’t more people willing to take these risks to protect the rights of women internationally. Moreover, in this internet age, access to accurate information about women’s health is an essential right to protect. We are grateful to learn more about this timely and extremely relevant work from Rebecca below. She illustrates a very clear picture of the current global movement for women’s reproductive rights and how the access to information is an essential piece needed in order to continue to move things forward for women everywhere. A medical abortion with a combination of two medicines, Mifepristone and Misoprostol is a very safe and effective method of abortion and has a success rate of approximately 95% to 98%. Very few serious complications result from medical abortions (World Health Organization (WHO), 2012). Mifepristone and Misoprostol have been on the list of essential medicines of the WHO since 2005. Unfortunately, Mifepristone could not be registered in most countries where abortion is illegal (in almost all South American, African, Middle Eastern and Asian countries but also in three European countries – Poland, Ireland and Malta). However women in Brazil discovered that a medical abortion could also be done with Misoprostol alone. Although the use of Misoprostol alone is safe, the failure rate is almost 10% to 15%. But ever since, home use of medical abortion with Misoprostol alone by women themselves is increasing in countries where abortion services are unavailable. Misoprostol is registered in almost all countries for use against gastric ulcers and prevention of heavy bleeding after giving birth. It is well documented that in countries where abortion is illegal, women risk their health and their lives to obtain clandestine abortions from unqualified persons in unhygienic conditions. According to the World Health Organization, 19 million women experience an unsafe abortion every year and 48,000 women die from complications of unsafe abortion each year. The development of medical abortion has been very important because it gives women the possibility to take their lives in their own hands again, independent of the legality of abortion and the availability of trained abortion providers. The health consequences are similar to a spontaneous miscarriage and most women deal with these themselves. In the rare case of a complication, this is almost never life threatening. The use of medical abortion is safer than the use of Penicillin or Viagra. Access to information about the medicines to do an abortion is lifesaving. Coincidently the public start of the Internet (1991) happened at almost the same time as the introduction of medical abortion (1988). In the past 20 years the Internet has grown exponentially and has become a major source of information for people all over the world. This also spurred the practice of telemedicine and later attempts to regulate it. So it is not surprising that women around the world started to use the Internet to access information about abortion services as well. This is reflected in the many discussion forums and online sales of Misoprostol and/or Mifepristone. Unfortunately there are many sites that provide wrong information and/or sell fake medicines without any information. These kind of fake services severely abuse women’s vulnerability and put women’s lives at risk. In 2004, Women on Waves (a Dutch non-profit organization) was the first to publish instructions for women about “how to safely do an abortion yourself” with the use Misoprostol alone on its website. Although Misoprostol is registered in most countries, the organization learned through its email helpdesk that a lot of women cannot easily obtain Misoprostol or in some cases the abortion attempt failed. A new project called Women on Web was initiated to support women in countries where there are no safe abortion services. On the Women on Web website, women can do an interactive web-based medical consultation. The answers to the online consultation are reviewed by a doctor. If there are no contraindications, a woman with an unwanted pregnancy till nine weeks can receive a medical abortion that is delivered by courier or mail to her home address. Women are closely guided in the process through a helpdesk in 12 different languages. The helpdesk now answers over 100,000 emails per year. Scientific research about the Women on Web service showed that outcomes of care are in the same range as other medical abortion services. Internet and medical abortion were both revolutions in support of human rights. While the Internet has the potential to support the freedom of information, the abortion pill has the potential to improve the health and lives of women. Unfortunately, as after every revolution that increases people’s freedoms, governments immediately started adapting and implementing regulations to keep it under control. In most countries very strict regulations apply as to where and by whom the abortion pill can be provided. The Internet is now used by governments for surveillance; breaching the human right to privacy of its citizens instead of guaranteeing the freedom of information. Fortunately, initiatives like Wikileaks can still also hold governments accountable for their actions. Access to information on the Internet is now controlled by big companies like Google, which censors the available information. In 2008 Google wrote a notice that they had revised policy and would stop ads about safe abortion information that we used to reach out to women. We were surprised. This was information about life saving medicines. It turned out that Google decided to ban all ads with the word abortion. The Health Equity and Law Clinic, Faculty of Law of the university of Toronto decided to take action and they wrote Google a letter expressing concerns about the adverse effect of the Revised Policy for women seeking safe and lawful abortion services. We argued that by restricting access to information, the Revised Policy may contribute to unsafe abortion in a manner inconsistent with human rights principles. Access to information – the right to seek, receive and impart information on health issues – is a key determinant of access to health care. The Internet is a primary health information source. It is of particular importance to individuals who lack access to traditional sources of health information, require confidential and timely access to information, and seek services outside of their communities. Online advertisements that promote abortion services can improve access to information on the legal status of abortion and the availability of lawful services, and can thereby reduce recourse to unsafe abortion. In the letter we also respectfully requested the policy be reviewed and rescinded. Of course we never received a response. Just a few weeks ago we decided to try again to place an ad in Arabic to be able to reach women in the Middle East with life saving information. But again Google disapproved the ad. So to protect our freedom to information we all need to seriously start looking for alternative browsers and other Internet services on a large scale. We need to take our violations of the rights to privacy by governments very serious. We should all start using Tor to anonymize our Internet use. Just as a principle. Because only if we all start doing that, the Internet will still have the capacity to support our human right to freedom of information.